My name is Jayson. Wanted to say hi and introduce my self. Like everyone else with photochop, I am the best graphic designer in the world. How you like that line of BS? Back to reality, I'm just a medicore at best chopper. Picked up CS4 2 years ago and some adobe traing books. Self taught my self Ill and PS. Still learning day by day. I have no free hand skill or design abilities. I am nothing more than a illustrator that needs direction. If you gave me a black PS file, it would be blank when I finished, lol. My strong suit is image manipulation and rebuilds. I'm not a artist and never will be or will be able to think like one. I think way to mechanically. I really like the mini contest, gives me something to do in my free time. I also like the participation on the site. I've seen some amazing chops and some not so amazing. But the cool thing is some of the amazing chops were not that creative, while some of the lower quality chops were amazing for concept, they just didn't have the skill to get on the screen what it looked like in their head. Plus I see ideas I would have never thought of. I also sub my income with a part time, home run graphic illustrator. I do some logo work, a lot of business cards/flyers, and lots of decals. I would post some pics of some of my decal jobs I've done but this forum thinks i'm posting spam links or some crap. So no pics for now. I can guarantee this site will instruct you. Or kill you, but either way it will change you. Keep on chopping. You may surprise yourself. Hi Jayson and welcome to PSC. I hope that you are able to pick up a few tricks and tips here. I know that I have and I am still learning more with various comments and ideas from other members here. Welcome Jayson. Hope you enjoy yourself at PSC. WELCOME... to "the life of Jason"! ...and to PSC! you have talent mate and good ideas! hope to see some nice chops next time! BTW... you have to win the braggin rights trofy to call yourself "the best chopper in the world"
When I walk across the water, then my critics say, he can't even swim! 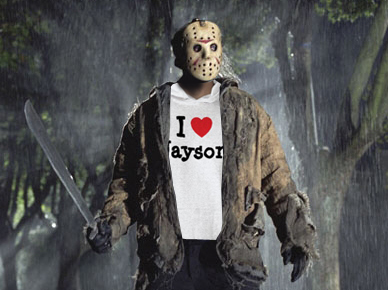 thats the reason why I wrote "Jason"!